For more than ten years Star Wars: Rogue Squadron 3D, which became a Star Wars arcade game classics, was a source of inspiration for many and many fans. Unfortunately unlike some other Star Wars games there is not any tool available which would let fan community to expand the game by developing additional levels and modifications. But lots of work has been done already for understanding the game data structures and the ultimate goal is to make new Rogue Squadron addons a reality. FOR ALL QUESTIONS/COMMUNICATIONS PLEASE USE THE FORUM. The petition asking LucasArts and Factor 5 to make the Star Wars: Rogue Squadron 3D level editor available to the fan community has been started in March 2009. After more than a year we have hit the bar of 200 signatures today. Factor 5 has been passing through dramatic decline which left its US office closed and many unfinished project canned. Recent news about president of LucasArts leaving the company cast a shadow on hopes for a Rogue Squadron revival project similar to highly successful Monkey Ireland Special Editions series. In September 2009 there was some correspondence with a game developer from White Harvest regarding our petition. What that person said about Rogue Squadron was that "...LucasArts owns all rights, assets and tools to all Rogue Squadron games, and are the only ones who can authorize this. I'm glad that you're still enjoying the old Rogue Squadron,... but I doubt that anybody will ever release the tools. It's actually quite a bit of work, and the interest isn't big enough (not unless the number of petitioners reaches 5 or 6 digits). Regardless, the request would most likely have to go through LEC." Our last year call for joining forces to develop Star Wars: Rogue Squadron 3D Editor by ourselves was not a success to put it mildly. But there were few interesting ideas floating around e.g. using an existing engine/game to start a Rogue Squadron mod/total conversion project. What do you think about it? Which engine/game is the best for such a project? Would you be interested in joining it? 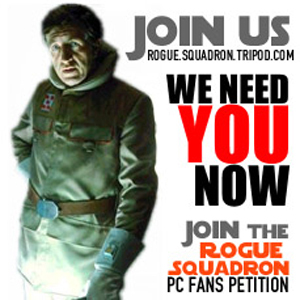 Unfortunately this was not much of a positive news, but it is encouraging to see that there are so many devoted Star Wars: Rogue Squadron fans around. Nevertheless a message with updates on petition is to be sent to LucasArts with a hope that this might result in their positive decision. Also wouldn't that be cool if Rogue Squadron ever had a multiplayer battle? We can battle ourselves out with any vehicle or craft. That would be awesome. I hope you guys are still on that Rogue Leader 3D. Can't wait to play the Battle of Endor and the Strike at the Core level on a PC version. It'll be exciting for me. I always wish somebody modded the game to let you play as Tie Droids because ever since I was little I wanted to play as them and even Tie Bombers. We have the right to recreate Rogue Squadron with new graphics ? The idea would be added a multi and take back missions to the campaign mode ? I see that the petition was created for that Factor 5 give us the level editor, but why wait Factor 5 ? I do not know much about the creation of the game, but I know that the re-created would be much better now, I think if this was more shared pérition you have had a lot of signatures. I think trying to find a creator team and proposed to them this project would be a good idea, do not you think? Well that's one more name bring the total signatures up to 476.